Solution: The accompanying diagram shows how the free energy, G, changes during a hypothetical reaction A(g) +B(g) → C(g). On the left are pure reactants A and B, each at 1 atm, and on the right is the pure product, C, also at 1 atm. Indicate whether each of the following statements is true or false. The minimum of the graph corresponds to the equilibrium mixture of reactants and products for this reaction. The accompanying diagram shows how the free energy, G, changes during a hypothetical reaction A(g) +B(g) → C(g). On the left are pure reactants A and B, each at 1 atm, and on the right is the pure product, C, also at 1 atm. Indicate whether each of the following statements is true or false. 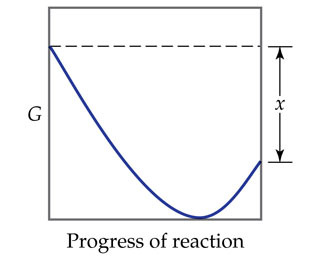 The minimum of the graph corresponds to the equilibrium mixture of reactants and products for this reaction.